Sony has already rolled out Android 7.0 Nougat to the Xperia X series and now the attention has turned to Xperia Z3+ and Xperia Z5 series. According to reports coming from Europe, it appears that the Japanese tech giant has certified the upcoming Android 7.0 Nougat for Sony Xperia Z3+, Xperia Z5 Compact, Xperia Z5, Xperia Z5 Premium as well as the Xperia Z4 Tablet. The update to Nougat carries version number 32.3.A.0.372, up from version 32.2.A.5.11 and as it is, the release date of the OS should be very close. 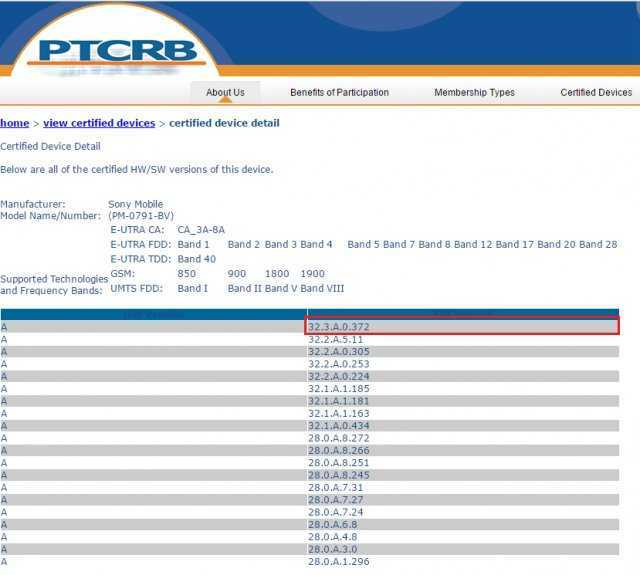 The OS was certified by cellular certification company known as PTCRB and it basically means that the consumer version of the OS will be released in the coming weeks, if not days. Sony had set its targets high on becoming the leader when it comes to rolling out Android 7.0 Nougat updates. As it is, the company is now updating its 2015 models while many other Android OEMs are now pushing out the update to their 2016 flagships. If anything, the Japanese tech giant is indeed leading the way. The Sony Xperia Z5, Xperia Z3+ and Xperia Z4 Tablet were all launched in 2015. The three have the same processor on board – Qualcomm Snapdragon 810 SoC – and while the Xperia Z3+ and Xperia Z5 are almost the same, they have their small differences to keep them apart. For instance, where the Xperia Z5 ships with a 23MP main camera, you get a 20.7MP rear snapper on the Xperia Z3+. However, the selfie cameras are the same. Despite the Xperia Z3+ being the predecessor to the Z5 series, you get a slightly smaller battery unit on the latter as opposed to the former, but there is a bigger battery on the Xperia Z5 Premium, which also has a larger 5.5-inch screen. The Z3+ has a 2930mAh unit while the Z5 comes with a 2900mAh unit – both support Qualcomm’s Quick Charge 2.0 technology. As for the Xperia Z4 Tablet, you get 10.1 inches of display with a smaller 8.1MP main camera paired with a 5.1MP front snapper. The battery is huge at 6000mAh.